I lived in a hospital from age 14 to 21. Have you ever been to a party where they play that icebreaker game? Everyone has to say one fun fact about him or herself that you probably wouldn’t already know. Well, “I lived in a hospital from age 14 to 21” is my line. It’s a safe bet that I’m the only person in the room who can make that statement. It usually gets a laugh, until they find out I’m not joking. It’s a unique story, but probably not as weird as you are imagining. My family lived in Shreveport, Louisiana, and Dad was a plastic and reconstructive surgeon. My parents bought a large private hospital to set up his solo medical practice. They had a vision for a business that was revolutionary at the time—a freestanding day surgery center. It was the late 1970s, and there were no other such facilities in Shreveport, and only a few in the United States. The building they purchased was originally a 1920s English Tudor home belonging first to the Ratcliff family, and later to the Frank Hemenway, Jr. family. In 1960, Dr. Peachy Gilmer acquired the home, enlarged it, and converted it into a 35-bed hospital. Later, a group of doctors bought it, and it became known as Fairfield Hospital. My parents established it as The Plastic Surgery Center. Mom was the administrator, and Dad was the surgeon. They made a great team, hired a staff, and set to work. Soon after buying the large 14,000-square-foot building, they realized that it had more space than the business required. So, they created a home for their family of five children in a designated part of the building. Meanwhile, the medical clinic and day surgery activities took place in the front half of the building. Spending those years in “the hospital,” as we often referred to our home/center at 3000 Fairfield Avenue, created a childhood that can’t be replaced. Here are some of my best memories. 1 – We had full access to a commercial-size Coca-Cola machine. Remember when soda machines had glass bottles? Ours was that type. Sodas were only 25 cents. My siblings and I were in cokes-for-a-quarter heaven! Poor Mom did her best to set carbonate limits, but we learned to quietly sneak them out of the machine. That just added to the fun of it. 3 – We had an elevator. It was the old-fashioned kind that required us to manually shut the heavy door. Next, we had to close an accordion-style metal gate by hand. There was a large lurch when we first hit the button for the floor we wanted. The hospital had three floors, which provided endless elevator entertainment for five kids. It was also fun to scare our friends by pretending we were stuck between floors. 5 – After hours, we had access to several well-equipped business offices. Copier machines are an everyday occurrence in homes now, but in the 1970s, they were not common. We had a full-blown Xerox machine. We taught our friends to lean over the glass plate to print out hilarious faces. We also had a few IBM Selectric typewriters we could use anytime … and office supplies … and plenty of desks for homework time … and business telephones with buttons that enabled us to put our friends on hold! 6 – We had a historic gazebo in our back yard. It was the site for many bridal photos and wedding proposals. I mentioned before that Dad has a great sense of humor. Well, the gazebo was old and in need of repair, so my parents hired some renovation experts to bring it back to its original 1920s glory. 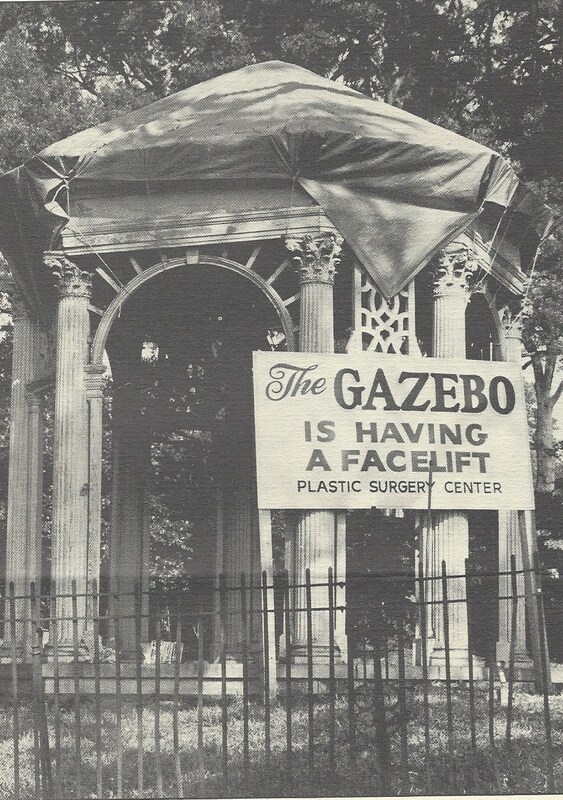 The patients kept asking what was happening to the gazebo. To stop the questions, he installed a huge sign on our busy street corner that announced: “The Gazebo is having a facelift.” It made it into The Shreveport Times. Our beloved Plastic Surgery Center has since been torn down and replaced with a large bank building. The gazebo was relocated a few miles away to the campus of Centenary College, which my parents and three siblings attended. But we still have our memories, and I wouldn’t change anything about those years growing up in a hospital. I think my brothers and sisters would agree. Thanks, Mom and Dad. 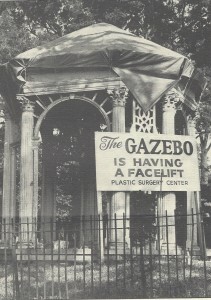 GAZEBO PHOTO BY: Langston McEachern (1918-2004), former photographer at The Shreveport Times.